Don't forget about those color-blocked dresses just yet -- they're here to stay for fall. 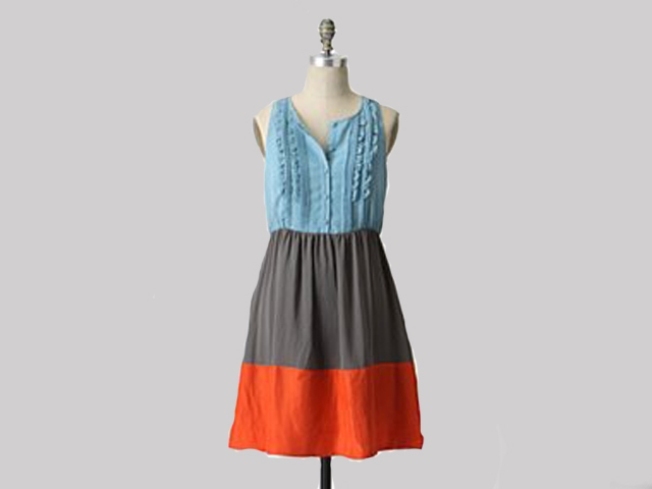 The trendy Sabine Dress ($158) from Anthropologie mixes flirty color combos with so-this-second ruffles on the front. But the back is just as cute, with pleating above the banded waist. Throw on a cardigan and heels, and you're ready for work or play! RCKNDY (1515 U St. N.W.) dishes up a fresh look at modern furniture with this Oliver Armchair by Gus Modern (was $375; now $149.99). The piece combines a casual elegance with a splash of modernity and hey, it's 60 percent off! And that leaves you plenty of spare change to shop around the uber-trendy home furnishings store. A new season means new kitchen essentials, especially with the suddent abundance of local wines this fall. Spruce up your space with a little twist on stainless steel from Urban Essentials (1330 U St. N.W. ), like the Fruit Pyramid ($30, pictured) or Spiral Wine Rack ($40). We love the sleekness of the wine rack, and the fruit pyramid is a definite conversation piece.